Welcome to the four hundred and fortieth of my blog interviews with novelists, poets, short story authors, biographers, agents, publishers and more. Today’s is with novelist and short story author (and Flash Fiction Fridays contributor) Marc Nash. A list of interviewees (blogged and scheduled) can be found here. If you like what you read, please do go and investigate further. Morgen: Hello, Marc. Please tell us something about yourself, where you’re based, and how you came to be a writer. Marc: Hi there. I’m Marc Nash, London born, bred and resident. I’ve just always resorted to the written word, I think I’m an observer by temperament. After a brief adolescent delusion that I could write lyrics, I passed over into writing stage plays for 10 years from University onwards and then when my twin boys arrived in the world and meant I couldn’t really hang around theatre bars at night, I tried my hand at prose fiction. Morgen: And if you’re like me, you’ll have been hooked ever since. What genre do you generally write and have you considered other genres? Marc: I’m not terribly comfortable with the concept of genre, but I guess my work would be tagged either literary or experimental, though the latter suggests that one’s work is somehow unfinished or unpolished. I’m interested in what can be done with the novel form that has stayed pretty fixed for over 200 years and that means I play with both narrative and language. I have written one novel which takes the genre form of a Police Procedural (with elements of the paranormal), but actually its purpose is to subvert the genre! Morgen: I’d be an agent’s nightmare; I’ve written four and a bit novels and they’re all different genres. 🙂 What have you had published to-date? Marc: I’ve written four novels and a novella, of which I have so far published two. The novella is with a designer who is doing some remarkable things with typography and design. The genre novel I mentioned above is being submitted to agents. 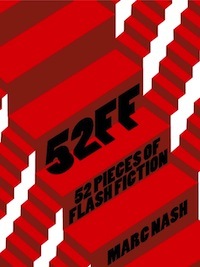 I’ve also published an anthology of 52 of my flash fiction stories. Morgen: I love flash fiction, most of my 5pm fiction pieces are flash. 🙂 Have you had any rejections? If so, how do you deal with them? Marc: Well if you add my playwriting ones to my fiction ones, I’ve had about 26 years worth of rejections! How do I deal with them? I pin them up on the wall of my study and use them to drive me on! I’m fully comfortable with the realisation that my work may well not be for the mass market. So I can kind of see where the agents are coming from. Morgen: That’s the best way to think… onwards and upwards. Do you have an agent? Do you think they’re vital to an author’s success? Marc: I don’t, but am trying for one. I don’t know if in this world of self-publishing and author self-marketing whether an agent would still be judged as vital. I’m pretty open-minded on the question. Morgen: Me too, never say never but continue eBooking and see what happens. Are your books available as eBooks? Were you involved in that process at all? Do you read eBooks or is it paper all the way? Marc: I originally published my debut novel in print, but currently my three titles are all only e-published. I did everything for this process other than the cover design, since I can’t even draw stickmen properly! I gave my designers a brief and we collaborated from that. Morgen: They’re very striking. How much of the marketing do you do for your published works or indeed for yourself as a ‘brand’? 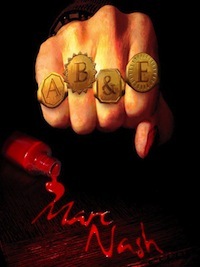 Marc: Everything. I only started writing flash fiction as a form of helping maintaining visibility while promoting the debut novel. A year later and I found I had enough for the anthology and that became my second published book. I always imagined marketing was far from creative, but have learned that it isn’t, it’s just a different sort of creativity. I’ve made videos, do live performances, neither of which I ever anticipated doing before I started out. Morgen: Videos are on my ‘to do’ list, I’m going to have to pick your brain on that one. 🙂 Do you have a favourite of your books or characters? Marc: Oooh I love this question! Marc: I do like writing unreliable narrators, because that allows me to consider the nature of storytelling and fiction itself. But Karen Dash from my debut novel “A,B&E” is a scary character and was great fun to write. The novel is written in such a way as she addresses the reader directly, like a conversation. She bullies, seduces, wheedles, teases, as she goes through the emotional ringer of her story. She is a very powerful woman indeed, although she has little power within the society she finds herself through the novel. Morgen: I love strong women. 🙂 Did you have the full say in the titles / covers of your books? How important do you think they are? Marc: They were the process of an active collaboration with the designers. I’m unsure as to their importance given that for ebooks they are effectively reduced to a thumbnail. Titles I think are very important. I like mine to have a couple of resonances behind them if possible. Morgen: Like you, I try to go for unusual titles and invariably write the story first then pick a phrase from it. What are you working on at the moment / next? Marc: I’m doing a novel based on the physics of Einstein and quantum mechanics, which is all about objectivity! I want to collaborate with a video designer to make one of my flash pieces into a video of kinetic typography (animated script). I also have two completed graphic novel storyboards which one day I’ll find time to find an illustrator to collaborate on. Morgen: That sounds like fun. 🙂 Do you manage to write every day? Do you ever suffer from writer’s block? Marc: No, not every day, but I have so much material to catch up on I’m never really blocked. I think my long journey as a writer has taught me not to waste negative energy bemoaning days where I haven’t been able to write. I often end up writing on the London Underground or in the bath, so even if I’m not formally sitting down at my desk to write, I probably have written something that day that I can transcribe later. Marc: Seems to happen for me that every story has its genesis in a central image or metaphor and the main character’s voice. Once those two come together, I just let it bubble away in my sub-consciousness for about six months, doing nothing but making the odd note. I don’t plan it. I don’t plot it, but when it’s ready to emerge after those six months, then I sit down to write it all out of a piece. That simmering process seems to put much of the plot structures in place and it just seems to emerge as I progress through the first draft. Of course then the hard work starts with editing in order to knock it into shape. Morgen: “bubble away” I love that. You mentioned Karen Dash, do you have a method for creating your characters, their names and what do you think makes them believable? Marc: For me it all comes down to voice. Getting that right produces the character for me (maybe a legacy of my playwriting days?) Voice involves how a character sees the world, how they express themselves, their level of education, their quirks, everything. Morgen: The character has got to be the most important element; if a reader doesn’t connect with the protagonist then the plot can be strong but the reader is less likely to care. You write flash fiction and novels, do you write any in between length short stories or non-fiction? Marc: I have a few short-stories. I don’t write any non-fiction, though I regularly contribute to a book-review site. I have a blog, but don’t consider myself a blogger. I mainly use it to upload pieces of fiction. Morgen: Me too… and a few other pieces here and there. 🙂 Do you do a lot of editing or do you find that as time goes on your writing is more fully-formed? Marc: I write my flash really quickly. I did one earlier tonight with barely a word changed once I set it down on paper. But the longer works need plenty of editing, because the layering and interconnections are far more intricate and extended. Morgen: It’s all practice isn’t it. Most of my daily stories have little changed to them, unless I’m not happy with them then they get pulled apart (usually at the last minute). Do you have to do much research? Marc: No. I like to underscore the fictional nature of my fiction if that makes any sense! Places I write about have only ever been visited in my mind, rather than me trying to describe an actual location. They are symbolic for me, rather than a need to fix a specific reality. Marc: Nearly always first person for me, as I like its intimacy with the reader. I have written one story second person, it was about linguistic programming of a cyborg; the borg was denied the concept of “I”, referring to its human master as “thee” and to itself as “it”. It was one of my favourite flash stories and was published in “Speech Bubble” online. Morgen: Ooh, I love the sound of that. 🙂 Do you have pieces of work that you think will never see light of day? Marc: Ha yes. Another work in progress which is about the schizophrenic nature of our English language, drawing on its Anglo-Saxon and Norman-French roots. It’s very dense and unless I’ve built up a serious reputation, no one is ever going to take a chance on it! I do want to finish it however, whatever ends up happening with it. Morgen: If no-one will take a chance then there’s always the eBook route. I like to think that if a story is well-written then there’s a market for it somewhere. What’s your favourite / least favourite aspect of your writing life? Has anything surprised you? Marc: When I’m immersed in writing that first draft, I resent anything that takes me away from it and breaks the momentum and the mood the writing is taking place in. That can be breaks for food or sleep. It’s completely preposterous to resent these things of course! Morgen: We do need both. I love going to bed but the sleeping part is such a waste of time. 😦 What advice would you give aspiring writers? Marc: To believe in your own artistic vision, but also to know what it is you want to achieve as a writer. Is it a level of sales? Is it the validation of being published by a publishing house? Is it to fill a venue to do a Q&A? Is it to tell an entertaining yarn for someone on their commute to work which they’re reading on their phone? Whatever it is, you need to be realistic, unflappable and fixated on bringing it about. Oh and of course, remaining flexible too! But I do think any author has to ask themselves what the written word and fiction itself means to them. Why for example do you want to write novels rather than say TV scripts? What is it that is uniquely intrinsic to novels that draws you to the form? Morgen: ‘Fixate’ is my middle name. 🙂 I had a go at a TV script for the now defunct Script Frenzy but didn’t like the bittiness of it… give me solid prose any day regardless of length (I’ve written from 27 words to 117,540 :)). Is there a word, phrase or quote you like? Marc: I’ve got a competition to win a hand-made artist’s sculpture used as a prop in one of my trailers and all the reader has to do is tell me which is their favourite word from the novel and why! I love words, both for their imprecision and the new meanings they make when brought together with other words. Morgen: Great! Are you involved in anything else writing-related other than actual writing or marketing of your writing? Marc: I am quite keen to perform a couple of my flash pieces with live music accompaniment. I did that a long time ago, but now feel I have the perfect pieces that lend themselves to it. That way I can also realise my adolescent fantasy of being a rock star up on stage! Marc: For my sins and it causes me way more aggravation than anything to do with writing, I used to manage my twin boys’ football team. Luckily this season I’ve been able to hand it over to a qualified coach, but I’m still very involved. Morgen: Isn’t that why people have sons? 🙂 Are you on any forums or networking sites? If so, how valuable do you find them? Marc: I’ve been a member of both YouWriteOn.com and Authonomy.com. Both are potentially useful for those relatively new to writing, but they also are partially dangerous in seeming to offer a honeypot of publishing treasures to very hungry authors which can lead to untrammelled behaviour on the forums. The sites reward you what you are prepared to put into them, but like publishing itself, they offer only the slenderest of opportunities to land an actual book deal. Morgen: I was on both sites for a while but just didn’t have the time to read everyone else’s work which is part of the deal to get yours (mine) read. It’s great if you have nothing else going on but take some of the feedback to heart (it can be unnecessarily cruel). What do you think the future holds for a writer? Marc: I think it’s all in a state of flux with self-publishing and e-readers and total free access to publishing. I’m not really bold enough to make any predictions on how it will all shake out. Morgen: Better for the authors these days I think. 🙂 Where can we find out about you and your work? Marc: My blog is www.sulcicollective.blogspot.com, on Twitter I’m @21stCscribe and am very active there. Marc: I have a couple of websites on the novels, http://marcnash.weebly.com and http://marcnashNIMN.weebly.com. I also have a YouTube channel with 17 literature-related videos, just type in sulci collective into the search function. Marc: Yes, would you consider running the British publishing industry because I think you’d be its saviour! Writers need love and nourishment and you provide that to the maximum! Thanks for this interview opportunity and all the best for your brilliant blog. Morgen: <laughs> You’re very welcome. If someone could magic an extra 36 hours in each day (so I could sleep more) then maybe I could do what I’m doing plus that. I do think the future is eBooks but pBooks won’t go away. People still love paper… they’ve told me so. 🙂 Thank you, Marc. Wish you were anywhere but here? If you are reading this and you write, in whatever genre, and are thinking “ooh, I’d like to do this” then you can… just email me and I’ll send you the information. They do now (January 2013) carry a fee (£10 / €12.50 / $15) for the new interviews on this blog but everything else (see Opportunities on the main blog) is free. Hi Morgen: Marc Nash is one of my favorite Twitter friends. I’ve had the pleasure of following Maarc on Twitter for a long time and always laughing like a silly little child with his famous plays-on-words that he posts so frequently. I compliment Marc on his sense of humor and writing style all the time, I think he has gotten bored with it. Ha ha. This interview is refreshing and illuminating. I learned a great deal behind Marc’s writing madness and am so pleased to hear that he is doing so well with the writing. He’s a great guy and a super nice person. “writing madness” I love it. 🙂 Thank you, Amanda.